This is probably the best platformer I have ever played. When I was originally asked if I wanted to preview 88 Heroes, I knew nothing about the game. I did some quick research and learned it was an up and coming platformer set to redefine what platformers are. I had no idea I would have so much fun or that it would be one of the best indie games I had ever played. The game’s story is a simple one, so I don’t mind spoiling it here. One day the evil Dr. H8 decided to try and take over the world. He told the world they had 88 minutes to pay him 88 octillion dollars or else 88 nuclear warheads would be launched at Earth. The governments of the world tried to call for the best superheroes, but they were unable to reach them. As a result, they were forced to call the 88 Heroes, which are essentially the reject pile. They have some of the strangest, dumbest, and sometimes most useless superpowers. But if they didn’t, the game would be no fun. Let’s start this review with the level design, there are eighty-eight total levels and four worlds with twenty-two levels per world. They start off pretty easy and get progressively harder with a boss fight at the end of each world. You have only eighty-eight lives and eighty-eight minutes to complete the entire world. You can collect coins to help however. Collecting eighty-eight coins will grant you the ability to revive one of three fallen heroes to be used again.There are both enemies to avoid as well as hazards as you progress and there are many different kinds of each. This is all standard platformer material, but that’s where the similarities to other platformers end (I’ll talk more about that in the next paragraph.) The levels are fun and unique and despite playing the game several times over, I never find myself able to memorize the levels or even get halfway through World 2. In this way the game is quite challenging. However, unlike most challenging games, I never seem to find myself upset, frustrated or angry. The pace and flow of the game make it feel like nothing is wrong despite the fact you may have just died fifteen times and the cast of heroes make each run unique and a completely different experience. Which brings me to the main event of this game: the heroes. Each of your eighty-eight lives is a different hero. They have different abilities, strengths and weaknesses. Most of them are spoofs of characters from movies and TV and some of them are pretty much useless. Take Glass Girl for example, who has no attack and dies if she takes too much fall damage. Some heroes, like Penelope Pixel, have some special abilities and, in her case, are immune to spikes. But some characters, like Blocktopus, Ladder Lola, Misfortune, and Bat Bot have abilities that completely change the way you play the game or possibly even cheat it. Blocktopus can create blocks that you can stand on, or block enemy fire. Ladder Lola can play a ladder that will allow her to climb through floors and ceilings allowing her to get outside the map. Bat Bot can move anywhere he wants, but the world only moves while he does. And Misfortune, possibly the greatest of all, can just flip a coin. On tails, you die instantly, but on heads, you instantly complete the level. 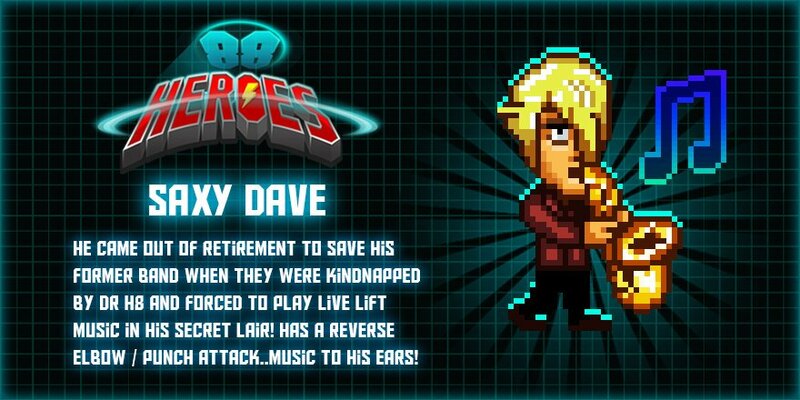 I won’t spoil anymore except for my favorite hero, Saxy Dave, who has no outstanding powers, but causes smooth saxophone jazz to play during his time on screen. The heroes appear randomly and go in round robin order, meaning you won’t see a hero repeated until you’ve cycled through all eighty-eight of them. If a hero dies, they are gone forever, unless revived by collecting enough coins.